WOW, IMPRESSIVE NEW THREAD KNOWLEDGE! Missing in action again, I know! It’s costume time around here again. Just can’t get away from my 20 year history of making costumes for drill teams. Do you suppose that might be because my favorite, and only, daughter is a drill team director? Makes it “Hey Mom” time again! I had some fun with a guild challenge last month. I love using and learning new techniques so this was a pleasure. We were asked to portray our idea of summer fun. 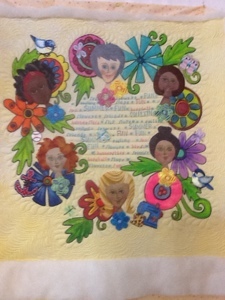 I got a chance to try out what I learned from an online Quilt Show class, the faces, and blended those with summer flowers made with Derwent intense pencils, Prisma colors, and embellishments. Then learned some of the ins and outs of stamping! What fun! 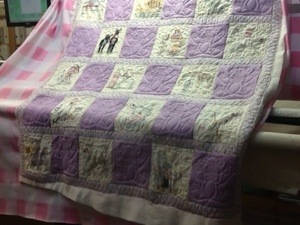 Here’s a picture, before the binding. Shed responsibility – quilt more!
. 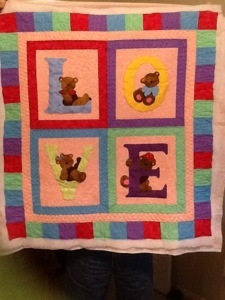 These are wonderful baby quilts. 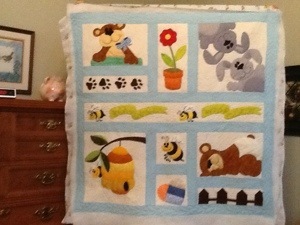 The first two were hand appliqués by Judy and the last was put together by Carol for someone at her church. They are all adorable. Watch for my next adventure. 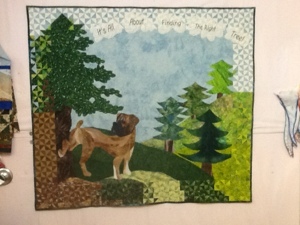 I have a small quilt in mind for a quild challenge..due in two weeks but time pressure works for me.